Hundreds of Berkeley High School students walked out of class Thursday in protest of racist and threatening messages that showed up on one of the school's library computers. Throngs of students waving posters and bullhorns took to Milvia Street chanting "black lives matter" and "raise a fist if you're not gonna take this" as they walked through Civic Center Park to Berkeley City Hall, demanding an investigation into the incident from school officials. The march — which Berkeley police estimate comprised of more than 700 people — ended on the steps of Sproul Plaza on the UC Berkeley campus, a site used for student demonstrations since the Free Speech Movement protests of 1964. "You’re the ones who showed us how, UC Berkeley join us now,” the students chanted during what Berkeley police described as a "peaceful and friendly" protest. According to a letter sent out by Berkeley High School Principal Sam Pasarow, "the hateful and racist message" was discovered around 12:30 p.m. Wednesday and contained threatening language toward African-Americans. 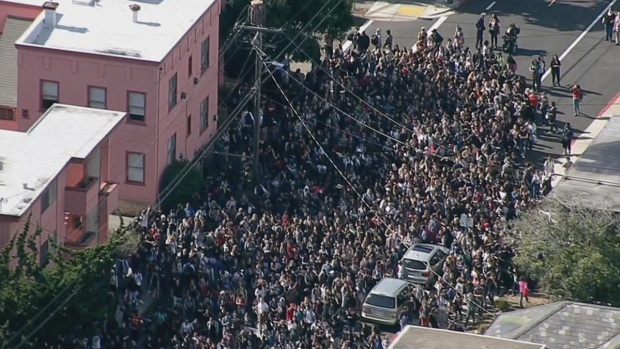 Hundreds of Berkeley High School students walked out of class in protest of racist and threatening messages that showed up on one of the school's library computers. Jodi Hernandez reports. The Berkeley High Black Student Union tweeted out a screenshot of the messages, which read, "KKK Forever Public Lynching December 9th 2015" and "I hung a n----- by his neck in my backyard," among other racist taunts. School officials announced late Thursday afternoon they had identified the student responsible for the messages. The 15-year-old student admitted to posting the message, according to Pasarow. The student is facing serious consequences, including suspension and possible criminal charges, officials said. The Black Student Union decried the messages, calling it a "blatant act of terrorism." "The safety of Black students has been explicitly threatened, and we as the Black Student Union demand that this is addressed immediately by the Berkeley High administration and Berkeley Police Department," the union said in a statement. The statement went on to say that in the past, similar acts against black students have been ignored. Berkeley High student Lucy Rosenthal tweeted that students were feeling unsafe after seeing the messages. 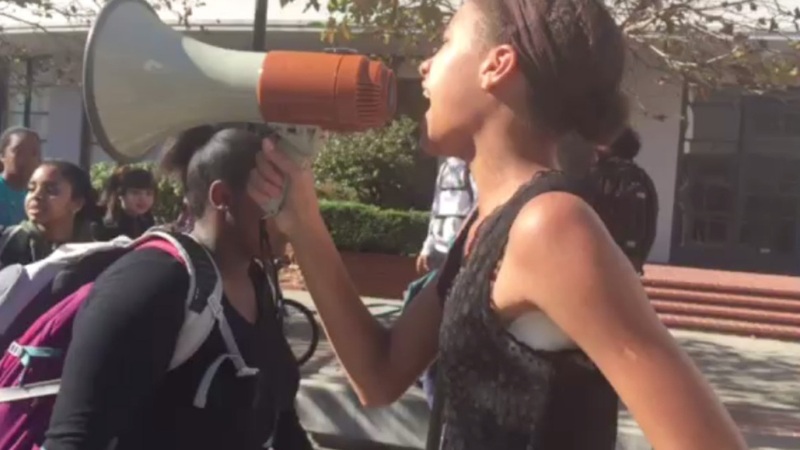 "As a black woman I feel terrified and I feel unsafe," said Berkeley High School student Aerin Creer. "They said a public lynching Dec. 9. I won't be around Dec. 9 because I'm liable to get lynched because I'm black." Students said they were angry that the district failed to inform them of the threat right away. Even though officials found the image around noon Wednesday, the principal didn't email students and parents until later that night. "I take responsibility for that," Pasarow said. Pasarow, who was at the Sproul Plaza demonstration, said he supports the walkout, and would work to ensure a safe environment for students. "This is a hate crime and messages such as this one will not stand in our community," Pasarow wrote in his email, adding that both Berkeley High School and Berkeley police were actively investigating the incident. "We are working hard to create a positive and inclusive school culture and we recognize the deep pain and rage that hate crimes such as this one bring to our students of color, as well as the damaging effects on our entire community," Pasarow's email said. "Even as we continue our investigation we recognize the need to address the harm that this has caused, and to that end we will be spending time planning as a staff about how to support and care for our students." Berkeley Unified School District spokesperson Mark Coplan told the Daily Californian that the screenshot was left open on the library computer; there was no actual hacking involved. Berkeley Mayor Tom Bates and Berkeley Berkeley Councilmember Jesse Arreguin — whose district includes Berkeley High School, and who was present at the student demonstration at Berkeley City Hall Thursday morning — also spoke out against the messages, saying that hate speech of any kind would not be tolerated in Berkeley. "Amazing! Way to Go @BerkeleyBSU! I wish I was there," tweeted comedian W. Kamau Bell, who lives in Berekely.